Being a writer, director, and producer of theatrical performances, but yet not coming from a background of formal training, has given me an uneasy relationship with set production design. I do it by default, since there’s really not anyone else at this point to think through and make the design decisions about our production. Luckily, the actual artwork isn’t done by me – if that would be the case, all of my productions would be nothing but black-box theatre. Here’s a sneak peak at part of the production set design for our show next month. 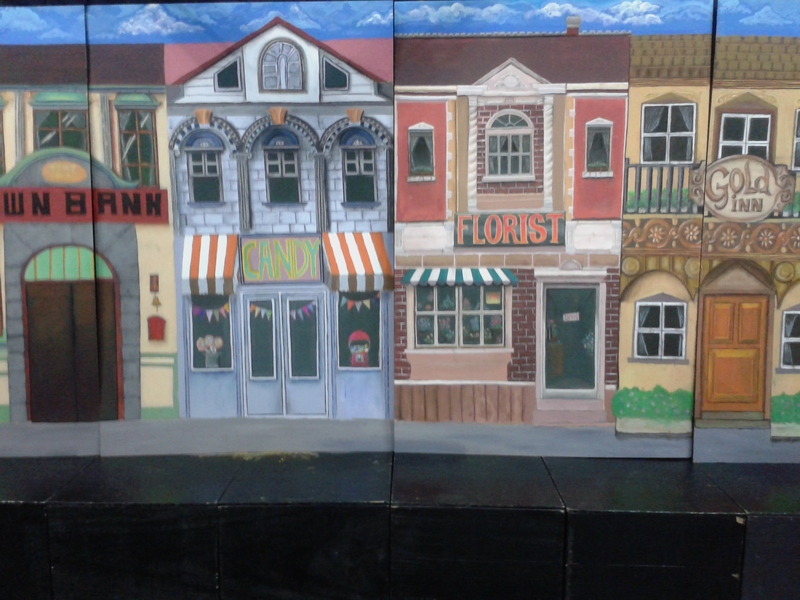 This awesome backdrop painted on thin plywood were skillfully done by one our of talented art classes. This is a town scene form 1903. It is difficult to tell from this picture how big these are. They are six feet tall and in the picture sitting on some drama cubes for our photoshoot we did yesterday. Realism and perspective are important in set design, but how much realism is needed to get the point across? These pieces will be in the background, flanked on either side by some additional black walls to help create depth and perspective. The action will be taking place quite a ways in from of this backdrop, but we are hoping that this will create a pleasing look to back the actors. Of course, we’ll never know for sure until we bump-in to the theatre. I remember my first dramatic production when I wanted so much realism that the set changes took 5 minutes between scenes. It was ridiculous, and I’ve learned a lot since then. 1) All pieces must be adaptable to other scenes. 2) Pieces which aren’t adaptable need to be able to be removed within seconds. 3) Scene changes (in most all cases) can occur when other action is taking place somewhere else – either on the side of stage or elsewhere. This ensures proper flow and minimal transition. 4) If a scene can be just as good without a prop of design piece which is a hassle, then don’t use it. Keep everything as simple as possible. 5) But don’t skimp on the essentials! Lots more coming up about the production of my new show! This entry was posted in drama and tagged live theatre, May in Penang, penangpac in May, set design, simplifying set designs, theatre production by sassevn. Bookmark the permalink. Beautiful work! I love set design. I did it when volunteering for our local children’s theater. It made me feel young again.